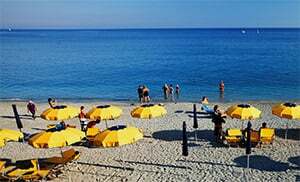 Visit the small village of San Bernardo and enjoy quiet holiday during your stay in Liguria, Italy. There is a small parish church right in the middle of San Bernardo. Besides there is an oratory of St. Francis of Assisi, which was constructed in 1680 behind the parish church. There is also a small chapel from 1732 in San Bernardo. Equally attractive is the war memorial statue on the church yard. For nature lovers, the southern slopes of Monte Bonomo are particularly interesting. In the limestone rocks are numerous small caves. The natural beauty of San Bernardo can also be enjoyed fantastically on walk ways and hiking trails. San Bernardo was built in the ancient times by a ligurian tribe. In 643 there were some battles against the Langobards, who looted in the area and made raids. San Bernardo was then integrated into the republic of Genoa, but it retained some degree of autonomy. The residents of San Bernardo struggled hard against poverty and they were mostly farmers, loggers and herdsmen. Arable land was scarce due to the thick forest in the area. It was only in the 19th century that some parts of the forest were cleared, thus creating new arable areas. Vines were also grown on the deforested fields. The people lived mainly on wood and coal mining, until the mines closed at the end of the 19th century. San Bernardo got itself involved in some wars in early 18th century with the neighbouring village of Pontinevra, and that caused many fatalities. The area was destroyed following the Napoleon occupation. Also epidemics like small pox or cholera ravaged the village. In 1861 San Bernardo was integrated into the Italian empire. San Bernardo is a village in the province of Savona which lies in the ligurian region. Near San Bernardo are several other villages like: Santuario (1.5 km), Ciatti (5.1 km) and Maggeni (5.6 km). When coming from Genoa, turn off the E80 in Savona and then follow the SS1 towards Savona, until you see the Via Vittime di Brescia on the left. Turn left on to that road and follow it until you see Via Ricci on the left, which you can now turn on to. Via Ricci will lead you to Via Santuario which you can follow up to San Bernardo.